Principal Cast : Bradley Cooper, Lady Gaga, Andrew Dice Clay, Dave Chappelle, Sam Elliot, Anthony Ramos, Michael Harney, Rafi Gavron, Rebecca Field, William Belli, Greg Grundberg. There are few musical names today that offer such polarising opinions as Lady Gaga. A pop queen, a diva, a showcase of bizarre and extreme behaviour and personality, Gaga’s rise as the preeminent songstress of the last decade hasn’t come easily, but it has cemented her as one hell of an artist of note. Casting her opposite Bradley Cooper in this, the fifth cinematic outing for A Star Is Born (following its debut in 1937) might be seen as a risky move for a singer not known for her acting chops (she did make a brief appearance in Robert Rodriguez’ Machete Kills, as well as his Sin City sequel, A Dame To Kill For, so she’s no stranger to the big screen) but the result is a performance – and film – that maximises the use of her astonishing talents and reveals a startling rawness to her acting that accompanies Cooper through this journey. Established singer-songwriter Jackson “Jack” Maine (Cooper) is falling apart: fuelled by booze and drugs, suffering tinnitus and the onset of hearing loss, he has few friends and lives a life of excess. After stumbling into a drag bar, Jack meets wannabe singer-songwriter Ally (Lady Gaga), a young woman with a powerful voice with whom he is instantly smitten. After Jack cajoles Allie into a performance on stage during his concert, she becomes a viral star, kicking off her own music career which Jack supports wholeheartedly. However, his drinking becomes a problem for their relationship, and that between his half-brother Bobby (Sam Elliot), with whom he grows estranged. Ally’s new manager, Rez (Rafi Gavron) pushes her into a different direction of style than Jack envisioned, and Jack becomes somewhat jealous of Ally’s career. Let’s get to it: both Bradley Cooper and Lady Gaga are superb in this film. Cooper, who both acts as well as directing his feature debut, handles the dual roles with conviction and surety, no doubt utilising the skills picked up over a varied career in Hollywood, and he goes about telling this story like a seasoned pro. His performance as Jack could have worked against the film, given he’s supposed to play a drunken addict intent on self-destruction trying to find solace with the one woman who loves him, and failing utterly. 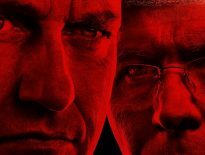 Those who have seen the previous versions of this story or are aware of the nature of its conclusion will appreciate the restraint Cooper showed in making Jack both empathetic and sympathetic, never once stepping into parody or generic simpleness. He brings layers to the role, foregoing the typical “leading man” stuff and uglying-up for the performance of his career to-date. It’s a truly great acting performance from an actor of considerable depth. Gaga, as Ally, is a revelation. Raw, natural and uncompromisingly real, Gaga’s work in the film is honest and true to the world it establishes. Scenes of intimacy glisten with her stripped-bare style, a far cry from the painted show-woman we’ve seen in countless music videos and concerts, and I honestly had to check and recheck the credits to make sure it was actually her. Obviously, her singing prowess remains the strongest aspect of the film, and when she’s asked to deliver, well, let’s just say she delivers. 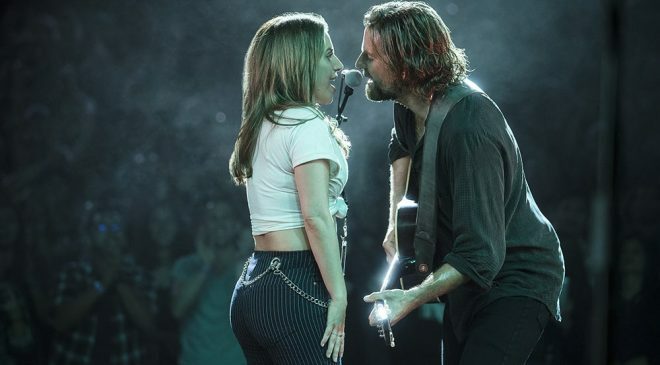 Several of the film’s songs are soul-crushingly brilliant, from the memorable “Shallow” and “I’ll Never Love Again” to her take on “La Vie en rose” during an opening number. Cooper, for his part, does some great work with his own songs including “Black Eyes”, and his vocal intonation is pitch-perfect for the weary, addled persona Jack is. 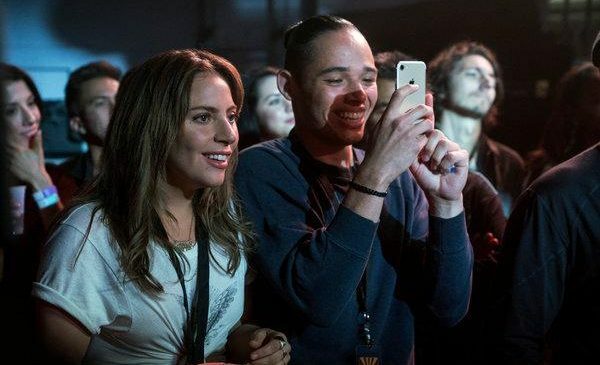 Together, they command the screen with every second they’re on it, Cooper the “old man” and Gaga the “young ingenue” looking for musical fulfilment and getting it at a cost. Their chemistry seemed believable to me, they worked together as an on-screen couple, and their banter and patter worked a treat. 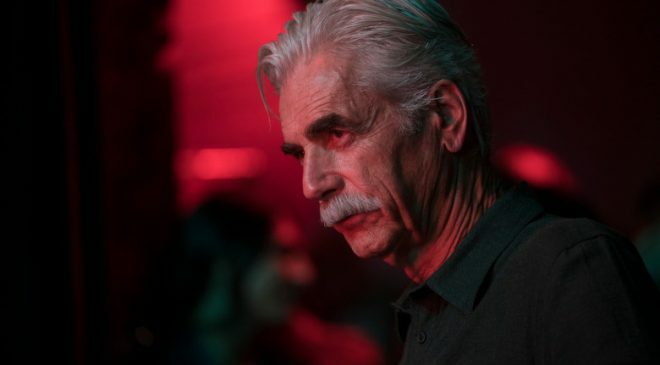 Supporting roles were also a surprise: Sam Elliot is an actor I’ve kinda typecast in my head as the stoic, wood-worn upright patriarch of whatever movie he’s in, but here he nearly brought tears to my eyes with a captivating role as Jack’s much older half-brother, Bobby. Dave Chappelle has a nice moment midway through the film, while Andrew Dice Clay (yes, that Andrew Dice Clay) is thoroughly excellent as the partial comedy relief role of Ally’s father, Lorenzo. You’ll also catch a glimpse of Greg Grunberg in a minor role of Jack’s driver, Eddie Griffin as a gospel preacher, and Rafi Gavron plays the slimy music producer Ally works with once her career takes off, and he’s also effective. Some might suggest that A Star Is Born is hugely manipulative, trading well-worn narrative tropes and character archetypes within its fairly thin overarching premise. This may be true for some, but in my opinion Cooper’s solid direction and unflinching depiction of addiction and substance abuse remands concerns by offering tangible credibility from both he and Gaga’s performances. The dialogue ranges from dead-on great to cornball goofy (the “I just want’a take another look at you” line is both dreadfully romantic and utterly trite in the same breath) but it’s all played with an honesty I didn’t expect. The film works best when the focus is solely on Cooper and Gaga, which is to say a large proportion of the film, with the production values of Jack’s concerts, as well as Ally’s rise to prominence (Alec Baldwin has a quick cameo on the SNL set) closely developed as a backdrop rather than the forefront of the story. There is a problematic aversion to giving Ally any kind of pushback to Jack’s alcoholism until it’s too late: the film seems to infer that Ally’s okay with Jack’s addictions and recidivist behaviour while it suits her rise to fame, even if never specifically noted in the script, but it’s a mystery that a woman of such strong will and character as Ally would subject herself to Jack’s behaviour for very long. Maybe I’m misreading it, but it did seem a touch strange that more time wasn’t spent on Ally confronting Jack about his erratic and belligerent behaviour some of the time – or until it was far too late. 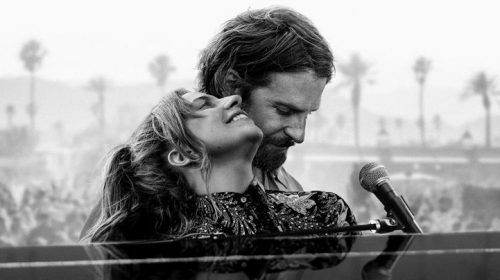 Led by Cooper and Gaga, A Star is Born is a terrific film and a heartbreaking parable around the entertainment industry. It’s a story of human wreckage, human strength and weakness, of love and music and sweaty emotional baggage, but most of all it’s a showcase for Lady Gaga’s sublime performance in a role she was… to bastardise a line from one of her songs… born to play. 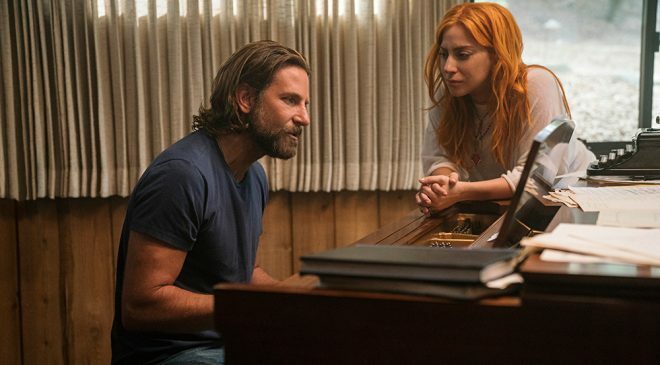 Cooper’s debut direction is excellent, the music is great and the story aches with the grand tradition of a Hollywood tragedy; A Star Is Born is one of the great films of 2018 and a rousing remake that deserves to be seen.